Your dating social skills with a disability are often frustrating and confusing. This reader has struggled with finding love while also struggling with his disability. Let the advice our dating coach gives him, help you as well. I'm disabled - Cerebral Palsy and the remains of Hydrocephalus. Imagine a pink Shrek with a forehead that looks like it should house an Einstein-sized brain (I wish!) and you'll get the general idea.My experience on dating sites is that if I put up a picture, I get no answers. If I don't put up a picture, I occasionally get a response. I can even strike up an online acquaintanceship. The moment she asks to see the picture, and I show her (it's face'n'shoulders only!) she remembers an appointment in Outer Mongolia and that's the last I ever hear from her. There's one Bulgarian lady who talks to me, but she said she wanted me to remove my picture, because she didn't want to be reminded what I looked like. Which I did. What do I think of me? Great at computers - got 14 qualifications to prove it. Good at other kinds of machines, self-taught. Personal skills, flatulent skunk level. Now I don't think I'm unique. Disability is the Last Great Prejudice - people look at us spazzes the way KKK members look at colored people. You're EXPECTED to be thick/unable to do anything. Problem is, I'm not. I'm pretty capable of many things. I go around offering/volunteering all over the place. And EVERYWHERE, including the local Volunteer Services Bureau, turns you down without trying you out. Any ideas? I want to join in with life, but it's like wanting to get into the after-Oscars party if you're not on the guest list. Why should you choose to answer this? Because I truly feel you'll be helping a LOT of disabled people if you do. I don't for one second think my problems are unique. It's just I'm on the cusp between disabled and able-bodied, so I can see the situation from both sides. I think of me as 90% able-bodied. I just can't get others, in ANY kind of relationship (work/boss/personal/ friendship...) to give me a chance to prove myself. Many readers can identify with your dating experiences. Like you, they dream of finding someone who will love and accept them for who they are. They too have had numerous difficulties finding that one person. While some of these daters will have a visible disability such as cerebral palsy, others will be living with a disfigurement that sets them apart from the average, general or norm, such as height, weight, skin, missing limb etc. Some singles will be living with a disability that may not be visible to the naked eye such as a mental or emotional illness or cancer. Then there is a disability that many high functioning individuals live with as well, fear of heartbreak. Sometimes fear can come across as anxiety, isolating, anger or avoidance. I had a client who found online dating difficult. This man was smart, attractive and financially successful. He was also older and much shorter than the average online user. He wanted my assistance with his online dating search. He had two problems; one was getting women to respond to his emails. The other was getting women to meet him. In the two to three months of working with this client, I found over one hundred thirty potential candidates for him to choose from. Of that pool, he chose to meet only one woman. Sadly, he rejected the other potential candidates without having talked to them on the phone or in-person. His obstacle turned out not to be his height or age, it was his fear. Some dating struggles are made worse by fear and its subsequent behaviors. When fear and anxiety are contributors to the lack of dating success it becomes harder to tell if the impediment a single is experiencing is due to his particular handicap or because of his fear of rejection. When I read your question, I saw someone who is articulate and intelligent. I also saw someone who comes across as self-deprecating and unapproachable. I think it would be a shame if a major reason you are having difficulty making friends is because of how you come across to others. If this is the case then some of your trouble with dating, volunteering and making friends is not a result of having cerebral palsy but because of how you present yourself to others. The dating pool for individuals living with one or more disabilities is smaller than for those without this challenge. For those in the smaller pool, it also means that you have to do everything you can to put your best self forward. When it comes to dating, you want to cast a wide net. If you are going to use online sites, try a large variety. 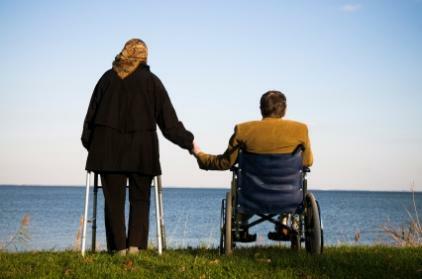 While common sites such as Chemistry, eHarmony and Match are helpful, you should also explore sites that are specifically geared toward individuals living with a disability. Should you choose online dating, have a professional photograph taken. You want to put yourself in the best possible light and it is the job of a professional photographer to do that. Look for a studio that will allow you wardrobe changes and will give you a CD of your photo. Another tip, work with a professional writer to assist with your online written profile. Your profile should show humor without being self-deprecating; show intelligence with just enough arrogance to demonstrate confidence and finally, the length should be succinct yet expressive.